The Cerino name has always been a major player in Cleveland. When I heard about the new pizzeria in Seven Hills that Eddie Cerino (grandson of Carrie Cerino) had opened I knew I wanted to check it out. Eddie’s Pizzeria Cerino uses only high-quality ingredients, such as imported tomatoes, and makes all of the sauces, salad dressings, and pizza dough from scratch. The quality really shines through in the food. I’ve been there several times now, even though I live in Cleveland Heights. There’s always a bit of a wait, but it is worth it. 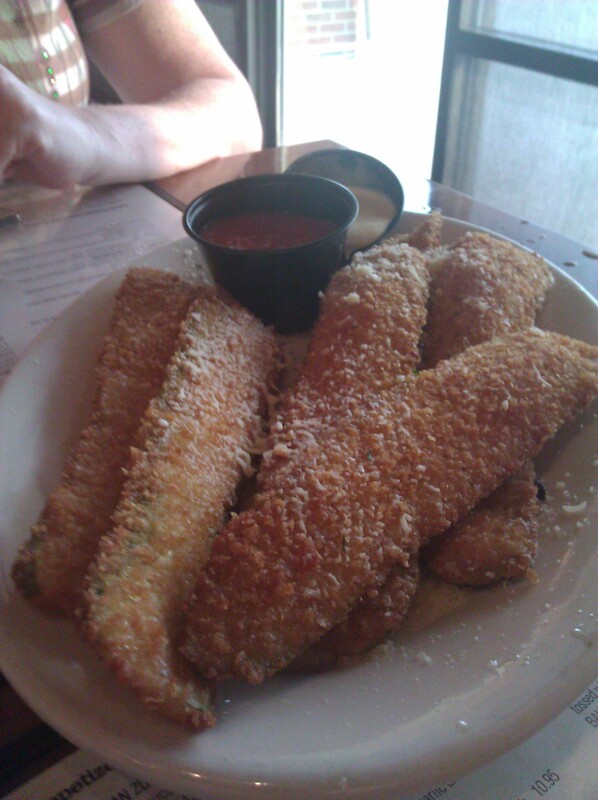 My friends ordered the Parmesan Zucchini Planks and fell in love with them. They are lightly hand-breaded, perfectly fried and ethereally light. They are served with marinara and lemon aioli dipping sauces. I couldn’t decide which sauce I liked the most with them. Both were absolutely delicious. Knowing I was going to order an entree but wanting to try the pizza as well, I ordered the Margherita pizza to share with everyone at the table. It was a thing of beauty. Just look at the slice in the photo. 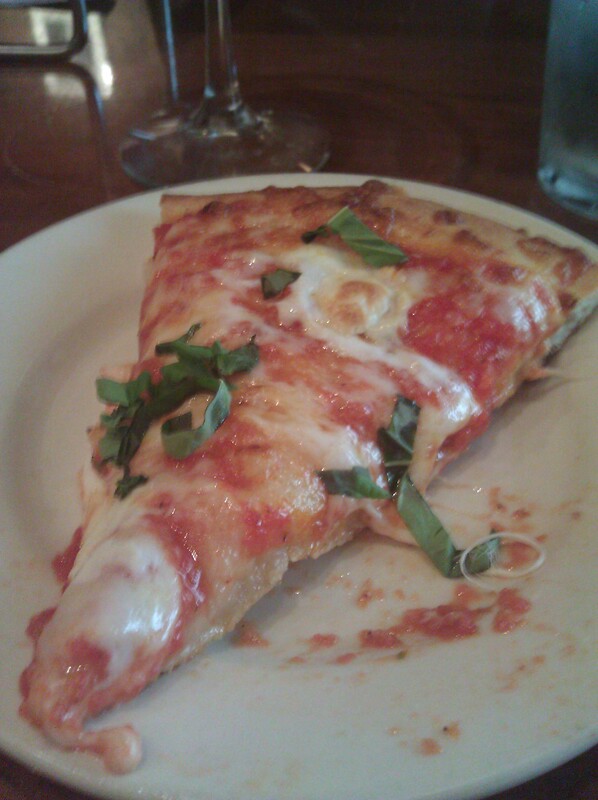 Fresh basil, fresh tomatoes, a delicious pizza crust – it just doesn’t get any better than this! I was tempted to order a second one just to bring home with me for the next day or two. You can tell a lot about a restaurant by the quality of their salad. 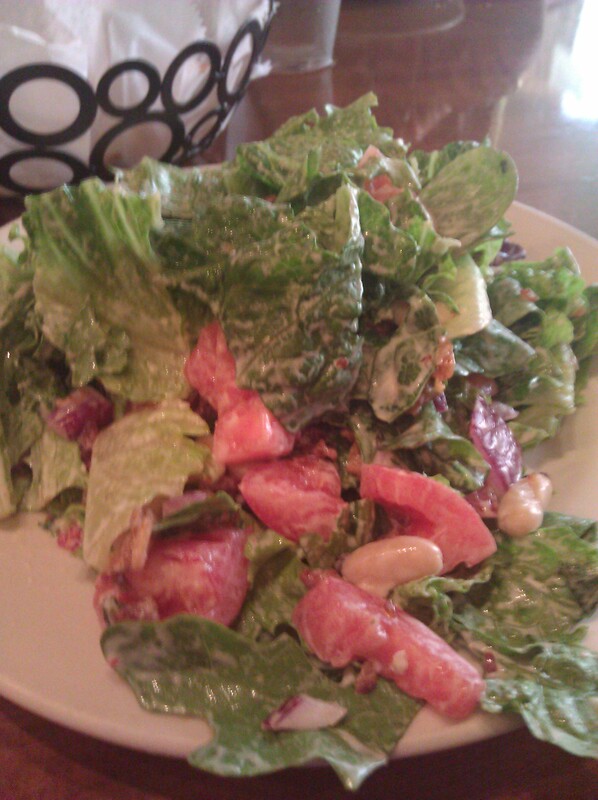 I started with the Tuscan Salad, which featured Romaine lettuce and field greens tossed with tomatoes, cannelini beans, red onion, Italian pancetta bacon, and Tuscan ranch dressing. The salad was light and fresh. The lettuce was crisp and not soggy, and the pancetta was not too overpowering. Just looking at the photo with the glistening tomatoes makes me want to run out and eat there again. I love that you can order half portions and full portions of the salads as well as the entrees. A half portion was just perfect for me. 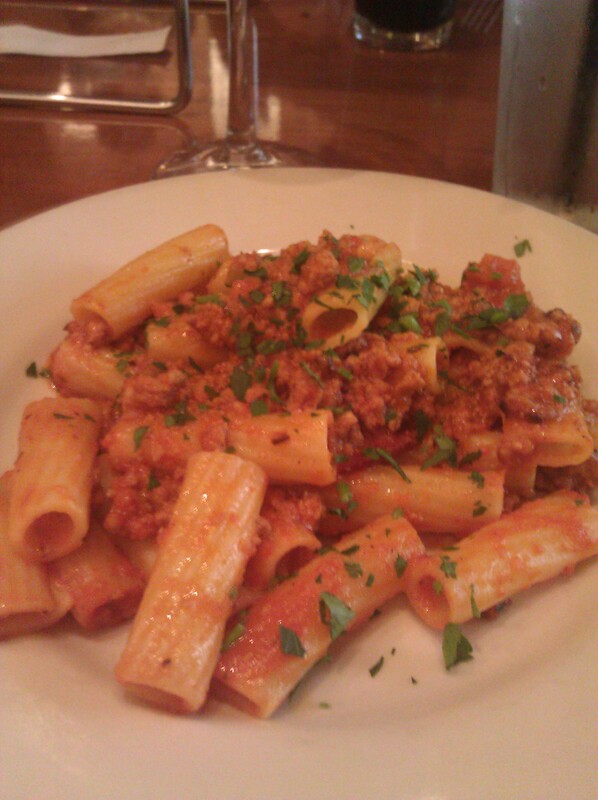 Being a huge bolognese fan, I ordered the Rigatoni alla Bolognese, which featured rigatoni noodles cooked perfectly and tossed with a hearty and flavorful meat sauce. The fresh basil on top really added to the flavor of the dish. I again ordered a half portion. It was perfect. I can’t even imagine how much a full portion is. I could easily see myself finding one or two things on the menu and falling into a rut of ordering them time and time again, but the menu is just chock full of really interesting choices that it would be a crime to do so. My friend R. loved his eggplant parmesan. C. swooned after biting into her wild mushroom ravioli special. The kitchen had no trouble making these entrees meat-free for my vegetarian friends. It is located on Broadview Road (just north of the intersection with Pleasant Valley Road) and is set back from the road a bit, so you may have some difficulty seeing it at first. It’s in the same shopping plaza as the Aldi, and Panera Bread is located in the next plaza. Thanks, this place looks great and it’s not too far from us.